A month before Haiti’s devastating earthquake, prominent musician Theodore “Lolo” Beaubrun and a few friends were summoned by spirits who tried to warn them about the impending cataclysm. “They told us to pray for Haiti because many people would die,” says Mr Beaubrun – the frontman of the group Boukman Eksperyans. The spirits may have failed to make themselves understood, but according to Mr Beaubrun – whose music and outlook are steeped in voodoo culture – they are standing by the Haitian people in their hour of need. “We are extremely traumatised,” he says. But Mr Breaubrun’s idea that voodoo should play a leading role in helping victims of the country’s worst-ever natural disaster is currently little more than a hope. Haiti’s traditional religion has kept a low profile in the aftermath of the earthquake. The songs and prayers heard amid the rubble and tent cities around Port-au-Prince are overwhelmingly Christian. The voodoo religion may be practised by many Haitians – the exact number is unknown – and has not been totally absent from the aid effort. 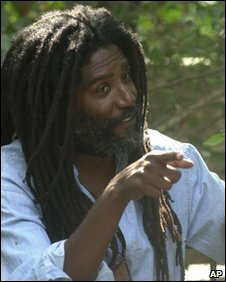 Louis Leslie Marcelin, another singer who also describes himself as a spiritual guide and healer, has used his home in Port-au-Prince as an alternative school and a care centre. But such efforts by voodoo leaders have been few and far between. The bulk of the religious relief aid work in Haiti has been carried out by Catholic and Protestant groups. “For a religion that’s supposedly the national religion of the Haitian people, it’s amazingly absent in the earthquake phenomena,” says Gerald Murray, a University of Florida anthropologist who has carried out extensive fieldwork in Haiti. Some argue that voodoo’s conspicuous absence in the aftermath of the quake is due to prejudice. Many Christians – especially Protestants – regard voodoo as devil worship. This idea was expressed in its most striking form by the US televangelist Pat Robertson, who said shortly after the quake that Haiti had made a “pact with the devil” when it defeated French colonists two centuries ago. According to Mr Beaubrun, such attitudes have been in evidence during relief operations. “Some Christian communities do not want to give food to voodoo followers,” he says. “As soon as they see people wearing peasant clothes or voodoo handkerchiefs, they put them aside and deny them food. Hostility to voodoo – which blends elements of Christianity with West African animistic beliefs and practices – is indeed rife among some evangelical groups in Haiti and elsewhere. However most mainstream Christians – notably Catholics – have insisted on not marginalising the voodoo faith. Blaming voodoo for the country’s problems, he says, is “theological nonsense”. “When the (Asian) tsunami happened it was not because people did wrong,” he says. The three days of prayer held for earthquake victims on 12, 13 and 14 February pointedly included voodoo practitioners. And, perhaps equally pointedly, a houngan (voodoo priest) taking part in the event stressed the common element between his faith and Christianity. He told the BBC he would “pray to bondye” – referring to the voodoo supreme god, while not stressing the “loa”, the lesser spirits that are at the centre of rituals. This suggests tension between Haiti’s rival faiths is not the main reason for voodoo’s lack of visibility after the earthquake. The principal factor, according to anthropologist Gerald Murray, could be theological. In the voodoo belief system, natural disasters are not caused by the “loa”, but by a distant “bondye”. The supreme being that unleashes the forces of nature is an unfathomable entity which cannot be influenced. Only the lowly “loa”, Mr Murray notes, can be accessed or propitiated – often through rituals led by houngans. The main role of these specialists, Mr Murray adds, is the diagnosis and healing of an individual’s illnesses. “They have not traditionally played a role of national, social leaders of any type,” he says. Many Haitians will find solace in voodoo, which remains an important element of Haitian identity. But the coping strategies it offers in the aftermath of the earthquake may be limited. I have to find out his name but, a minister or pastor who is from Haiti was on a show called TBN years ago. He dedicated Haiti back to God, and renounced the curse. So, how can this be because of a “pact with the devil”? Personally, I think some form of technology (scalar) triggered this earthquake at the fault line. i believe that it is caused by natural dissasters obviously it is ludicrous to say that a spiritual cult caused haiti disaster its nonsense …… my sone has home work to research how voodooism and rastararianism differs from catholicism and protestantism i am findin it difficult there is so much to read .